As we prepare for the Christmas season, one tradition always seems to add that extra bit of magic to the entire month of December, The Advent Calendar! I love this idea for a box tree! 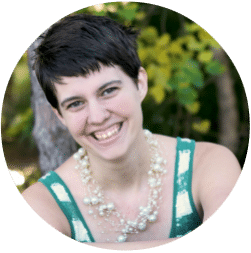 She has free printables so that you can take small boxes and make your own box advent tree. I love this idea for an activity bag advent calendar. Use her printables to make each day magical with a new activity to do as a family. I love that this is a low cost advent calendar that puts the focus on spending time together as a family! This Christmas Countdown surprise box is easy to store, but makes each day in December more magical than the last! Use this fun printable to make a one sheet scratch off advent calendar for your kids. They’ll have so much fun coloring it and can do a new one each year. I love this tutorial using craft match boxes and Christmas paper to make a pop open advent calendar tree to enjoy all month long. This is a fun tutorial that shows you how to make an adorable snowmen advent calendar for the kids. 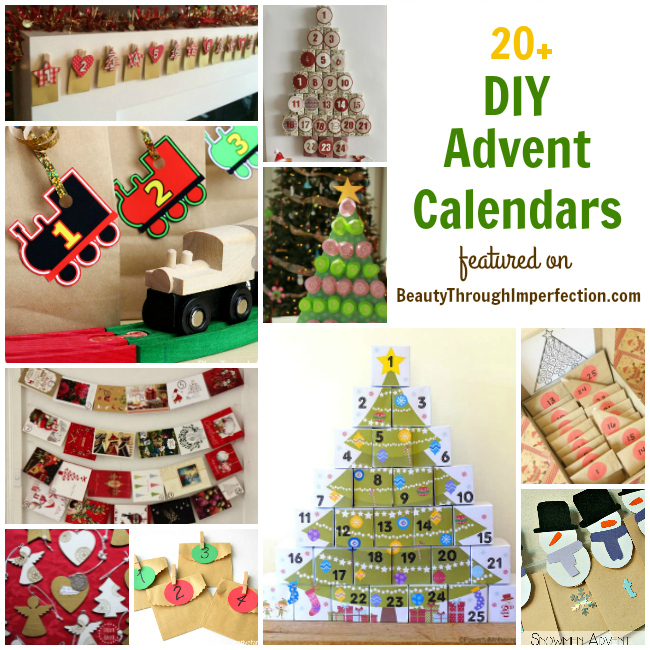 This is one of the simplest advent calendars I’ve seen, but it’s just as fun as the rest! Use festive cups to make this Christmas countdown. This list of 100 Christmas activities would make the perfect addition to your homemade advent calendar. Choose one activity a day to do all December long. This fun felt nativity scene advent calendar idea has instructions to tell a different part of the Christmas story each day leading up to Christmas. This mom wraps up Christmas themed books and reads a different storybook each night in December. You can see our top 25 Christmas books here. This fun train chain doubles as a decoration! Print your train advent calendar here, or check out even more Christmas train countdowns. You can use toilet paper rolls, milk jug lids and other things from around your house to make this adorable recycled advent calendar. These cute advent calendars can be made by siblings for each other. I love that it is a simple way for brothers and sisters to give something special! Instead of buying one at the store, you can print out this gorgeous advent calendar. 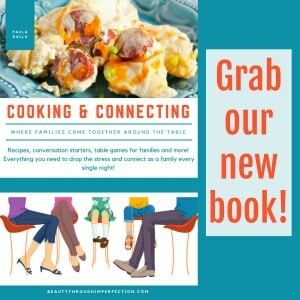 Each day, flip over a new card to find a fun activity to do as a family. You know I’m all about Christmas on a budget, so this toilet paper advent calendar is a new favorite! 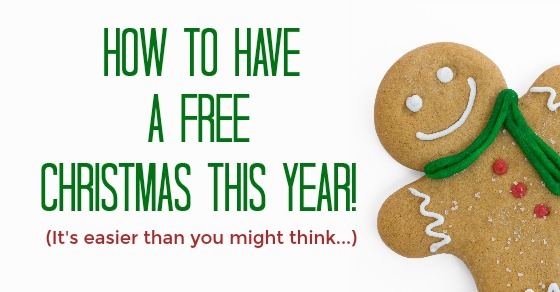 Related: How to SAVE BIG on Christmas this year. If you are stuck trying to choose the perfect activities for your advent calendar, look no farther than this list of 24 simple kids activities for advent! If you want to go with the christmas book idea, try stacking them into a snowman, or this fun Christmas tree. One of my favorite Christmasy themes are the little elves. This blogger made 24 mini elf homes as her elf advent calendar! We always decorate our tree the first week of December, so this is a great fit for our family. She made scratch-off ornaments with fun activities to count down until Christmas. If you are out of time, make this quick and easy advent calendar. For those of us who forget to do things like this until a couple days into the month of December, this is a PERFECT solution! You can also print out these fun chalkboard cards with fun holiday tasks to do as you countdown through advent! This mom’s approach is to take things you already have laying around your house, to make a fun Christmas tree advent calendar. How do you count down to Christmas? I’d love to hear your favorite ways! If this has overwhelmed you and you’ve decided you don’t want to DIY your advent calendar this year, try one of these gorgeous options from our affiliate. 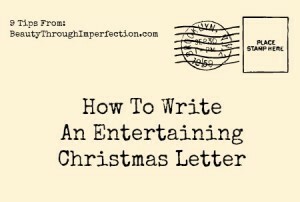 related: Click the image below to be taken to a post with tips for writing an entertaining Christmas letter! Thank you for featuring our Peg Snowmen I am currently making this year’s calendar and it’s going to be a lot of fun. Thank you for sharing our calendar…reminds me I need to get organised for this year! The little elf one with little elf houses is our favourite! 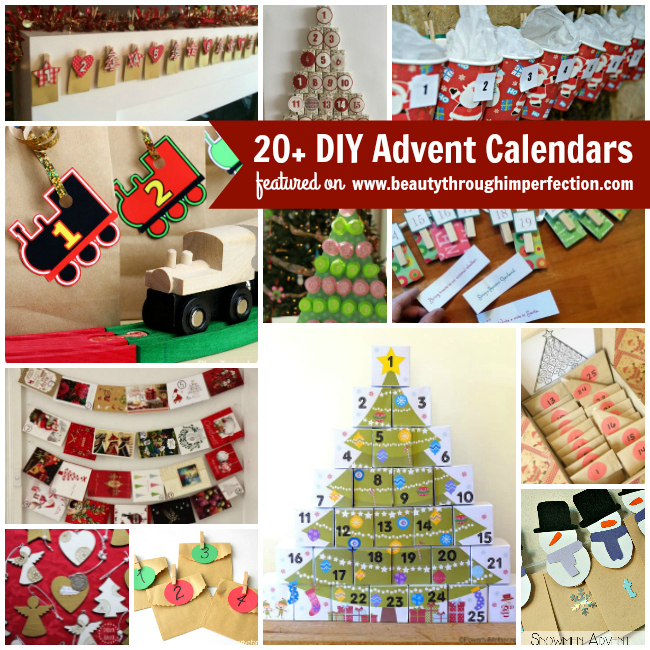 Hey Buddy!, I found this information for you: "20+ DIY Advent Calendar Ideas". 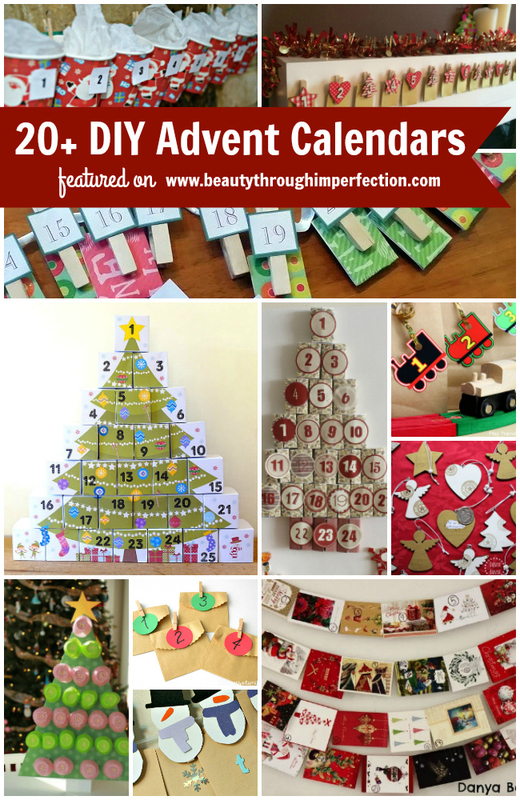 Here is the website link: https://www.beautythroughimperfection.com/20-diy-advent-calendar-ideas/. Thank you.